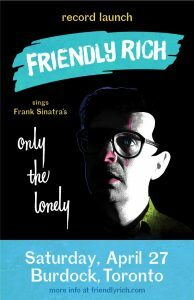 Friendly Rich Sings Frank Sinatra’s ‘Only The Lonely’ – Record Launch! Friendly Rich is launching a new studio recording at The Burdock on the night of April 27th. It’s a complete re-imagining of Sinatra’s classic 1958 recording, Only the Lonely. Don’t miss this rare opportunity to hear this incredible band bring these thoughtful David French arrangements to life, for one night only!